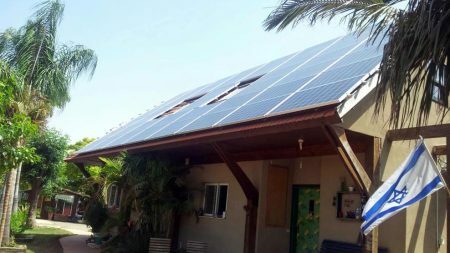 The solar energy system on Kibbutz Mashabei Sade is currently in the process of being installed on the Chicken Farms’ roofs; this is a high-voltage system with an installed size of 2000 KilloWatts. Due to bio-security restrictions, large construction teams were employed to minimize construction time. Panels by Yingli and inverters by Kaco were installed in the solar energy system. The solar energy system is in its final installation stages before its connection to the power grid.